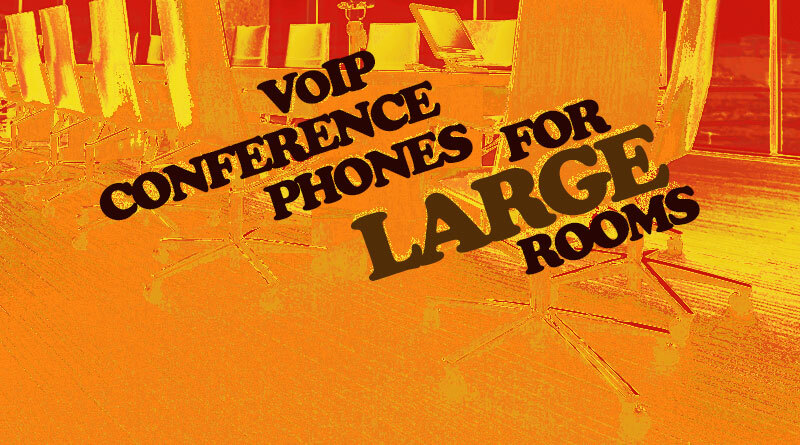 Large rooms present specific challenges for VoIP conference phones. In this blog, we tackle common problems businesses face when deploying conference phones in larger spaces. These spaces might accommodate 10-20 participants at one time. Conference calls are likely to be more formal in nature. This blog is the first in a three-part series on conference phones for different sizes of rooms. Stay tuned for future articles on midsize and small rooms, including huddle rooms! When using a conference phone in a large room, there are a number of challenges you need to confront. Here are the features you should look for. Voice pick-up. Make sure the microphones of your conference phone have a coverage area that is equivalent to your room. Expansion microphones. If your room is too large for the conference phone, you’ll need expansion microphones. They can come in either wired or wireless formats. Voice separation. It’s not good if all the voices come in a jumble. Voice separation refers to the ability of conference phones to keep voices clear, even when multiple people speak at the same time. Noise reduction. Because large rooms equal more people, which in turns equals more noise, your conference phone should emphasize noise reduction. Simple call control. You don’t want to keep all those employees waiting for the conference call to start. Many people need to be able to manage calls, so emphasizing familiar interfaces is a good idea. Here are three recommendations for professional conference phones for large business rooms. 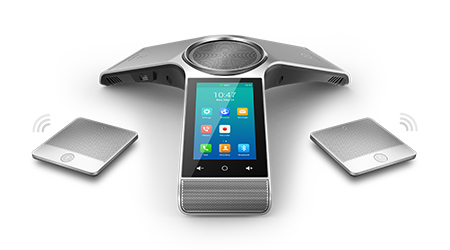 Dolby Conference Phone brings the incredible audio you know from the cinema to your conference room. With a perforated dome grille based on the shape of a wok, a subtle LED ring to indicate call status, and a classy touchscreen display, Dolby Conference Phone is one of the best-looking business phones you can find. Its performance matches its looks. The microphone array feature class-leading sensitivity that means you get HD audio in 360°. Dolby conservatively offers an estimate of 20ft pick-up range, but it’s really closer to 30ft. And if that’s not enough, Dolby Satellite Expansion Microphones are available. These wired mics extend the voice pick-up range by 6.5ft each. Dolby Conference Phone supports two conferencing protocols: SIP and Dolby Voice Room. SIP is an open standard, which has led it to be the most widely used protocol for business communications. That means your Dolby Conference Phone works with an enormous range of VoIP phone systems. In SIP mode, you get the incredible audio quality, as well as advanced features like dynamic leveling. With most phones, far voices are much quieter than close voices. Dynamic leveling balances audio levels in real time to ensure everyone can be heard equally. 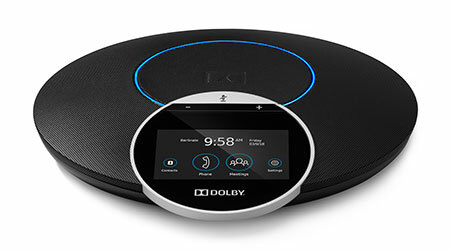 Using Dolby Conference Phone as part of a Dolby Voice Room system unlocks its true potential. Dolby has developed a proprietary audio codec that provides class-leading voice quality. The codec enables voice placement. It records where each speaker is in space and transmits that information, so the other end gets the most natural conference experience available, improving comprehension significantly. 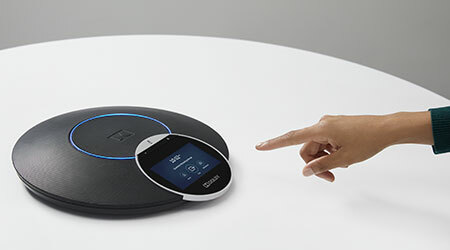 The conference phone also acts at the hub for a full-fledged video conferencing system when used with a compatible platform like BlueJeans Rooms. 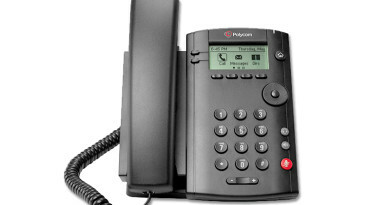 Polycom Trio 8800 IP Conference Phone is perhaps the most popular network-enabled conference phone on the market today. Its modern, flat design with sharp corners lends it an air of sophistication. The large touchscreen display makes operating the phone as simple as using a smartphone. 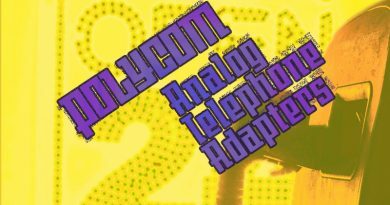 Polycom is known for their three-point phone designs, the result of practical problem solving. It gives their phones 360° audio pick-up. The Trio 8800’s microphones are sensitive enough to pick up voices out to 20ft in all directions. If you need more reach in the conference room, Polycom Trio Expansion Microphones are available. These stylish wired mics bring more voices into the conversation. The product of over two decades of audio conferencing experience, Trio 8800’s audio quality is a big step forward. It comes with proprietary enhancements to improve the conference call experience. 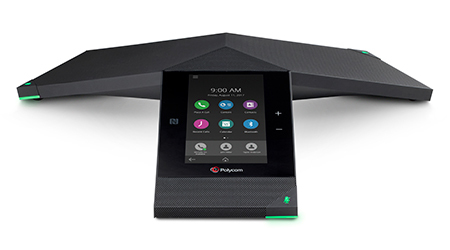 Polycom NoiseBlock gets rid of non-speech background noise. 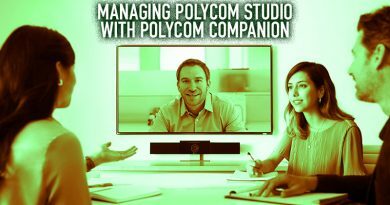 Polycom Acoustic Fence blocks out unwanted voices. Trio 8800 is more than a phone. 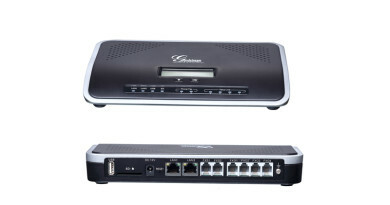 When used with Polycom Trio Visual+, Trio 8800 acts as a hub that drives three media: voice, video, and content sharing. You could set up a Trio 8800 as a conferencing station for your employees to collaborate. 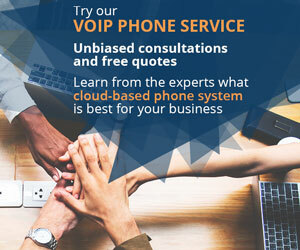 Trio 8800 supports the open SIP protocol, giving you maximum interoperability with standards-based VoIP phone systems. It actually supports three SIP lines, giving you the option for hybrid line registration to simplify call platform transitions. We offer the Polycom Trio 8800 Skype for Business Edition, which is Microsoft certified for Skype for Business and Office 365 Cloud PBX. Polycom has announced Trio 8800 Microsoft Teams Edition to ship in early 2019. Yealink CP960 is a strong contender for the best balance of cost-effectiveness and quality. CP960 runs a customized version of Android operating system, giving you a familiar interface to reduce learning time. CP960 has a nicely contoured silver body with an HD touchscreen display. The microphones capture audio in the round out to 20ft. The 10W speaker packs enough punch for everyone in the conference room to hear the conversation. If the 20ft voice pick-up range is insufficient, Yealink CP960 supports wireless extension microphones. Yealink CPW90 Wireless Extension Microphones feature the same Optima HD audio quality with echo cancellation as the base phone. Each mic has a voice pick-up range of 10ft in 360°. They use DECT to communicate with a paired CP960. CP960 features Yealink Noise Proof technology, which reduces background noise and mutes the microphones until human voices are heard. This combination goes a long way to eliminating distractions. Yealink provides certain unique features to streamline the conferencing process. Hybrid UC Meeting lets you route calls from a smartphone or a softphone using Bluetooth or USB to join a conference call. Pentagon Meeting Room provides a virtual meeting room interface, simplifying the management of up to 5-way conference calls. The active speaker is automatically displayed, keeping the flow of the meeting clear. Find an extensive selection of business VoIP conference phones for large rooms at IP Phone Warehouse!